It was a tough week for National Presto Industries. First, the Board pulled the plug on its popcorn popper configuration mark, and yesterday its electronic skillet configuration mark was short-circuited. The Board affirmed a refusal to register the configuration shown below, for "electric skillets," finding that Preston's proof of acquired distinctiveness under Section 2(f) was inadequate. In re National Presto Industries, Inc., Serial No. 85883551 (April 19, 2016) [not precedential]. The mark comprises the curved handles of the skillet, not the metal base or the glass lid or the knob (which are shown all in dashed lines). Of course, under Wal-Mart, product configurations cannot be inherently distinctive, so Presto resorted to Section 2(f), relying on its use of the "mark" since 2005, sales of more than $65 million, more that $5million in advertising expenditures, and distribution of some 80,000 product catalogs. The Board observed that sales figures showing commercial success of the product are not probative of purchaser recognition of the product's configuration as a source indicator. The critical question is whether the product design is being used and advertised in such a way that consumers "associate the product design with a particular applicant, and therefore view the product as emanating from a single source." So-called "look-for" advertising may be particularly probative. Here, there was no evidence of "look-for" advertising. Although Presto's skillet has been actively promoted and sales have been significant, there was little evidence that consumers recognize the shape of the combination leg/handle of the skillet as a source indicator. 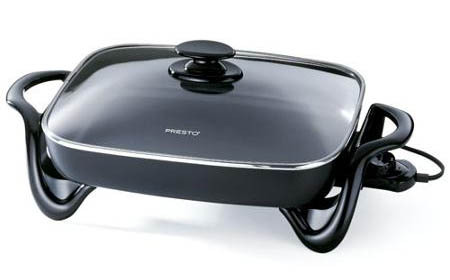 While the advertising displays the skillet and touts a few features of the product, there was no attempt by Presto to draw attention to the leg/handle design as a trademark. Self-serving statements by Presto's Secretary and General Counsel regarding the purported wide association of the design with Presto were not corroborated by any evidence. The Board therefore affirmed the refusal to register under Section 1, 2, and 45 of the Trademark Act on the ground that the applied-for mark is a non-distinctive product design that has not achieved acquired distinctiveness. TTABlog comment: During prosecution, the examining attorney withdrew a Section 2(e))(5) functionality refusal. It seems that there is rarely ever evidence of "look-for" advertising. Is anyone aware of cases in which an Applicant was able to rely on "look-for" advertising to establish acquired distinctiveness? Another patent lawyer here in a futile effort to misuse trade dress law. Even if registered, most federal judges are going to see right through this.